Samsung Galaxy S Advance i9070 - Gadgets Info. The Samsung Galaxy S Advance i9070 has been beautifully crafted to incorporate some of the recent innovations to optimise the overall user experience. 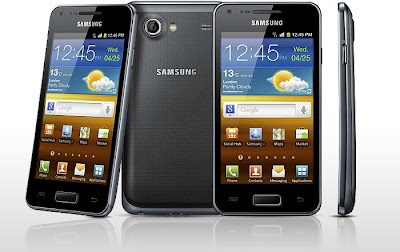 This Samsung Galaxy runs Android v2.3 (Gingerbread) operating system on 768 MB of RAM for fast response to your commands. Latency in operation is further reduced by thedual core Cortex A9 processor that has maximum clock speed of 1 GHz. The 4 inch super AMOLED screen fitted on this bar-shaped touch operated phone is highly responsive to your commands. User-friendly nature of this device gets a resounding boost from TouchWiz 4.0 user interface that complements the Gingerbread. Graphics and images, on this screen, gain more vibrancy from WVGA resolution of this screen. This resolution has pixel density of 480 x 800 pixels. The 5 megapixel camera fitted on the back side of this Samsung mobile phone helps you to click impressive visuals of your surroundings. The primary camera of this device is accompanied by an LED flash to let you click clear visuals even in dim light. This phone camera supports HD video recording with 1280 x 720 pixels of resolution and that too, at 30 fps. This phone camera, with touch focus and image editor, has attempted to redefine photography through handset. The front panel of this phone carries another camera of 1.3 megapixels to help you indulge in voice chat or to click a self-portrait. You have the option of tagging your photos with geographic location through geo-tagging for better recall, at a later point of time. The trendy looks of this mobile phone will surely get you in the limelight for a unique style statement. When you are on a call, the proximity sensor helps the screen to lock itself to avoid any accidental touch. The display of this device switches between landscape and portrait mode with the help of pre-loaded gyro sensor. Other sensors loaded on this phone include accelerometer, compass, light sensor and geomagnetic sensor. The Samsung Galaxy S Advance is a sleek device that has dimensions of 63 x 123.2 x 9.69 mm and hits the scale at 120 g to be lightweight. The jumbo battery of 1500 mAh, hidden beneath the case of this mobile phone, promises to fuel a talk time of up to 15 hours and 7 hours on 2G and 3G, respectively. Samsung has taken care of your storage related requirements by embedding this phone with a sufficiently large memory space. However, to keep all your favourite multimedia files at your disposal, you can expand the memory up to 32 GB with a microSD card. The GPRS and Edge enabled Samsung Galaxy I9070 gives you the freedom to connect to the world of Internet through 2G network. If you want to browse the world of Internet at faster speed, then the 3G supportof this phone is just meant for you. This Wifi enabled Android based phone allows you to utilise the nearest Wifi hotspot to surf through the web pages. Samsung has attempted to deliver a phone that is more than a device to you. If you are lost in the streets of an unknown city, then ask you phone about the direction as it features A-GPS with Google Maps. Geographical distance will fail to keep you away from your loved ones as you will stay in touch with them through ChatON, Google Talk and Messaging apps that are pre-loaded on this device. You can use the Bluetooth and USB connectivityof the Samsung Galaxy S Advance I9070 to conveniently share files and documents with your friends. Further, the Digital Living Network Alliance or DLNA compliance of this device will help you connect with a range of other DLNA compliant devices.